In today’s business world, the critical importance of a reliable, high-speed data network is almost impossible to overstate. Most companies – in fact, most industries – would be completely crippled without their Internet connection to the rest of the world. Even within the company itself, the reliance on network connectivity is heavy. So whether you use simple Internet services or require a number of dedicated privatized networks, we believe that reliability should be inherent to the service provided. Compu-Phone is partnered to leading network providers who have sterling reputations for their 99.9% uptime. When it comes to your business, we accept nothing less, and neither should you. Let us review your network needs and current structure to help design and implement a solution that will keep your business online without hiccups. MPLS provides networks with a more efficient way to manage applications and move information between locations. With the convergence of voice, video and data applications, business networks face increasing traffic demands. MPLS enables class of service (CoS) tagging and prioritization of network traffic, so administrators may specify which applications should move across the network ahead of others. 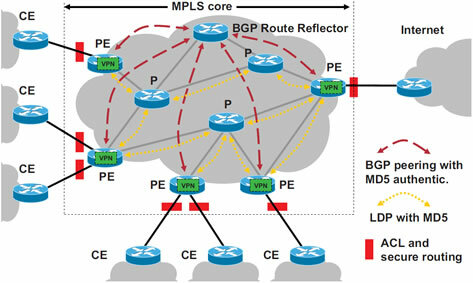 This function makes an MPLS network especially important to firms that need to ensure the performance of low-latency applications such as VoIP and their other business-critical functions.